This doesn’t apply to every retailer – just those who sell cigars individually without packaging. ALERT: A U.S District court has placed an injuction on this requirement. However, you need to be prepared for this requirment if it is required once the legal matters are resolved by the court. We Card will issue an alert once the case is finalized. 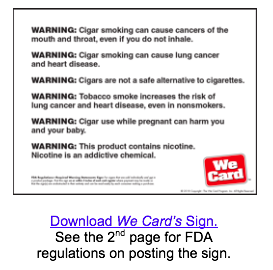 To assist stores in their compliance efforts for this new FDA sign requirement, We Card has a download version for you to use. You can also create your own sign and make sure to follow FDA’s specific requirements (from size and font selection to placement). See FDA’s requirements here. Then, to find out what the sign must say, go here. It is unknown if FDA will support this new sign requirement by supplying a sign for free to retailers. You may wonder if FDA plans to look for these signs while it conducts inspections – once the court case is resolved. Finally, just a quick reminder that this September is We Card Awareness Month. 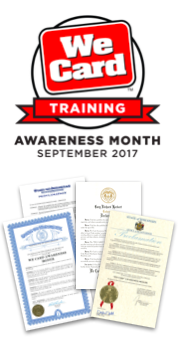 During Awareness Month, we want to help you responsibly sell age-restricted products and comply with FDA regulations and state and local law. So mark your calendars (there’s a reminder page just after August 31st), and make sure to order 2019 materials at www.wecard.org. Our online training is always available, and our door is always open for your feedback on how we can improve our tools and training to help you identify and prevent the underage sale of age-restricted products.